It’s been one of those days. Your alarm didn’t go off and then your car wouldn’t start so you were late to work, your boss got smart about it, and to top it all off you were so busy playing catch-up all day that you didn’t get a lunch break. You are exhausted and frustrated and you kind of just want to scream. Do you know what you need? A big, steaming vat of self-care. But in order to get the most out of your self-care on those days where you just need five minutes to unwind… You need to make sure you have a space where you can go to get peace. A scared space, if you will. 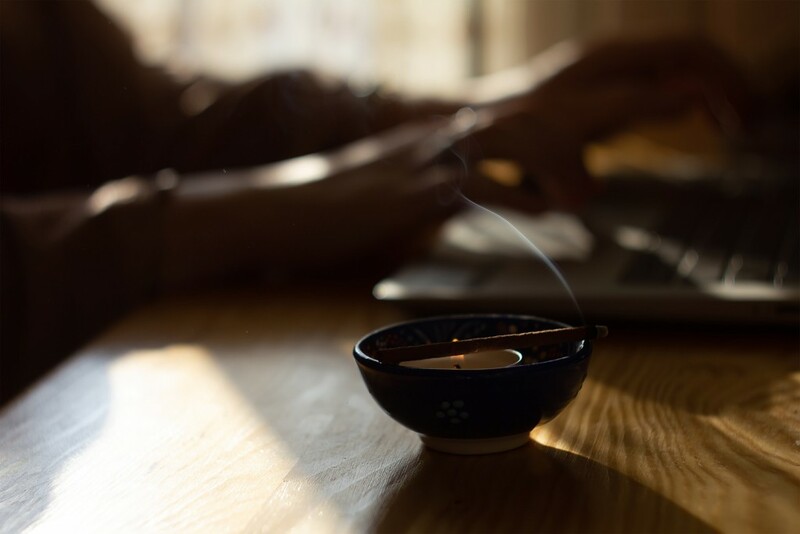 Read on to discover 10 tips on creating a sacred space at home so you can make sure that next time, you’re able to immediately unwind from your awful day. You want to pick a location that will stay sacred. Don’t pick somewhere busy or high-traffic – pick a place out of the way. You want something quiet, set back, and set apart. If you need to, put up a beaded curtain or a partition to keep the space separate if you’re sticking with a corner of a specific room. Otherwise, if you can, use a separate bedroom, a revamped pantry area, or a room that isn’t used very often. Once you have that place picked out, you want to separate it out as your sacred space. Don’t taint it by sitting there to work or pay bills or anything. Keep it sacred! This is a space for your self-care – where you should meditate, reflect, strive for harmony. If you taint the space by doing other things in it then it will no longer be sacred. You’re going to want to use your sacred space as a way to energize your spiritual chakras so make sure that once you pick the location that you meditate on how to make it truly sacred. You’re going to want to spend some time there in solitude getting to know it and figuring out what you need to incorporate to make it truly sacred and special. Get in touch with each of your senses through meditation and allow that to guide you in picking how you decorate and fill the space. Sound: Bring in a CD player so you can play some soothing music or hang some windchimes by a window where the wind can get at them. Find sounds that make you feel peaceful and incorporate them into your space. Taste: Things like having a dish of peppermints for mental clarity can go a long way. Or calming herbal teas that you can drink while you’re in your space. Figure out what you want from your space and then pick tastes that help you achieve that. Smell: Lighting scented candles or burning incense is a great way to incorporate your sense of smell. Sight: Decorate with things you love and that you find beautiful and calming. Mirrors, posters, art – anything that makes you feel peaceful and at home. Touch: The best way to incorporate touch into your space is by using different textures. This can be achieved with different cushions or blankets. But can also be achieved by incorporating things like crystals, feathers, etc. You want to make sure you’re physically comfortable in this space, too. It’s not just enough to be emotionally comfortable. Pick comfortable seating, soft cushions, a recliner, a rocking chair – whatever makes you feel comfortable and helps to make you feel at peace. This is an important one. Access to fresh air – like a window – helps to encourage happiness, purity, and growth. Windows also let in the sunshine. If you can’t find a space with a window then try an air purifier instead. Be creative about where you find your space and how you fill it. No two sacred spaces are alike, so do what you need to do for yours. Just because your friend has crystals and candles all over her sacred space doesn’t mean you have to have those in yours. Look at what brings you peace, brings you happiness and incorporate that. These items don’t have to be elaborate or expensive. Instead, it’s most important that they’re meaningful to you and that something about them reminds you of why you’re in the sacred space to begin with. Try using things that are already present in your home before you go out and buy anything new. Once you’ve got your space set up and filled with meaningful things and you’re ready to begin using it for self-care – inaugurate the space. Do a ritual smudging ceremony if you want. Use a favorite mantra, meditation, or prayer. Light a candle with intention. It doesn’t matter how you do it, but do something to set this space up for the sacred intention with which you created it. Use your sacred space ritualistically. Figure out what works best for you and then do that over and over again. Reflect on your life, your thoughts, your prayers and use your time in this space to set your intentions. Now that you know how to go about creating a sacred space in your home to help with your self-care routine, it’s time to step things up. Check out this link to chat with a psychic to help you figure out how to level up in all areas of your life.